Distribution: Rainforests from central-eastern New South Wales through to far north-east Queensland. Derivation of Name: Archirhodomyrtus...from Greek archi, first, rhodo, a rose and the genus Myrtus, referring to the appearance of the flowers. beckleri... After Dr. Herman Beckler, a botanist with the ill-fated Burke and Wills expedition. Archirhodomyrtus is a small genus with a single species, A.beckleri, occurring in Australia. A.beckleri is a small tree or large shrub of upright growth habit and growing to 3 to 5 metres in its natural habitat (a bit smaller in cultivation). The leaves are dark, glossy green up to 75 mm long by about 20-25 mm wide. Like many species in the myrtle family they contain aromatic oils which are very noticeable when the leaves are crushed. The flowers are five-petalled, usually rosy pink in colour and about 10 mm in diameter. The flowers are followed by yellow to red fruits which are edible but not especially palatable. 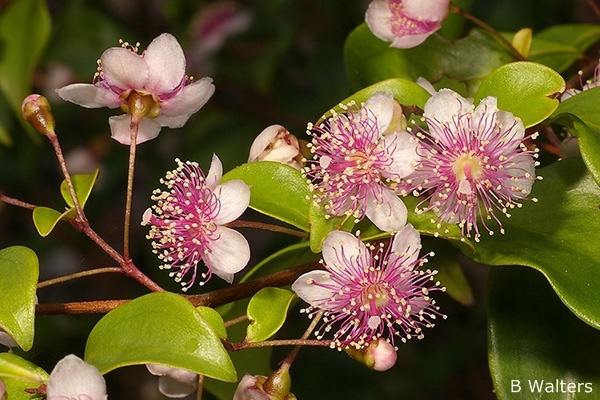 Rose myrtle is a very adaptable garden plant suited to temperate, sub-tropical and tropical gardens. It is reasonably frost resistant and tolerates a wide range of soils. It succeeds in semi shaded to full sun positions. It is available from many specialist native plant nurseries and deserves much wider cultivation. The species would make an excellent plant for a large container. Propagation is probably best from cuttings which strike readily. Propagation from seed is also possible but germination may be slow and spasmodic. In common with many rainforest species, fresh seed gives the best results.